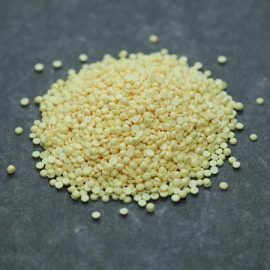 Brimstone 90 Sulphur is comprised of consistently sized 4 x 2 mm, half bun shaped pastilles, containing 90% Sulphur. 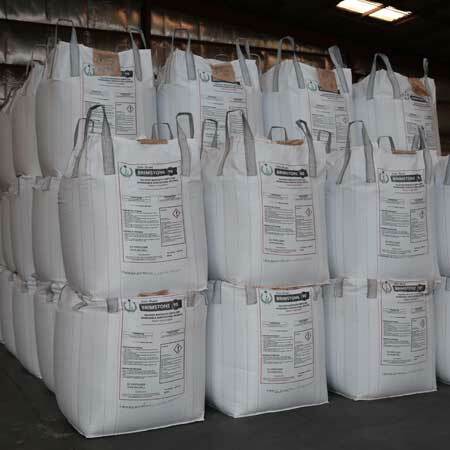 The free flowing and dust free characteristics make Brimstone 90 ideal for blending with other fertilizers. It is easy to handle, move, and store making it user-friendly in the field for application to the widest range of crops. 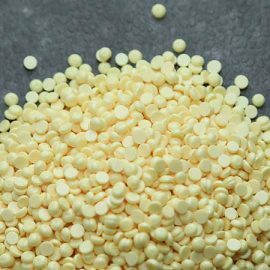 The special formulation enables the different sized particles of Sulphur within the pastille to breakdown at different rates so that there is a steady conversion to sulphate over time. One annual application of Brimstone90 makes Sulphur available to the crop throughout the year; from seed germination through to harvest. In addition, the Sulphur applied must have a release and availability profile that carries the crop right through the season without deficiency. Sulphur deficiency is getting more and more widespread, with negative effects on yield, nitrogen utilization and crop quality. It is necessary for Chlorophyll formation. Brimstone 90 yields finely divided Sulphur with a large surface area for rapid and effective oxidation into Sulphuric Acid. The extra H (hydrogen atoms) generated neutralizes the excess of hydroxyl and bicarbonate ions causing alkalinity and reducing soil pH to levels that free up the availability of P, K, Ca, Fe, Mg, Zn and Mn that are otherwise blocked by high soil pH (alkalinity). 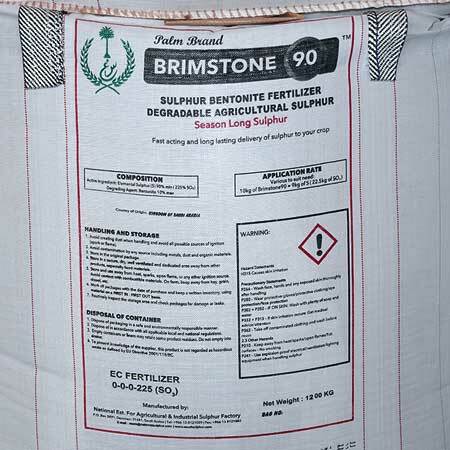 Brimstone 90 Sulphur (90% Sulphur) can solve soil problems caused by sodium bicarbonate. 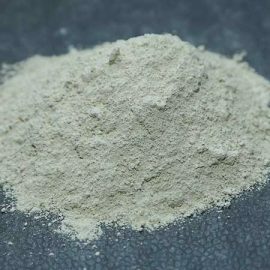 Brimstone 90 simply dissolves lime (calcium carbonate) by putting much larger amounts of soluble calcium into the soil; in this way the damage from sodium and bicarbonate to the soil is reversed. 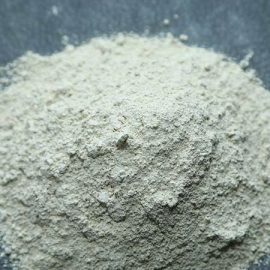 Additionally, some nutrients such as phosphorous, which is less available to the crop in a calcareous soil, are slightly dissolved in the area near the Sulphur particle making it easier for the planet to absorb them. 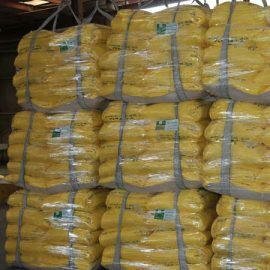 Sulphur is one of the essential elements for plant growth. 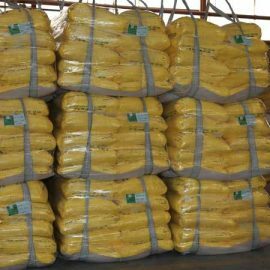 It affects crops yield and quality by altering the soil pH and increasing the phosphorus, manganese and micro nutrient availability. A field experiment was conducted that was aimed at evaluating the effect of sulphur applications on the yield of Barley. It was found that the yield of barley was increased by sulphur fertilizer treatment. 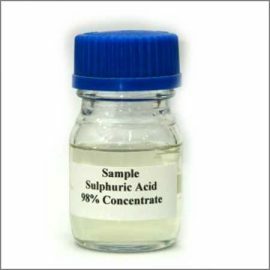 The use of sulphur and phosphorous, at certain ratios, gave the best response. The yield of Alfalfa was doubled in the third year of the experiment by using sulphur fertilizer treatment, and tripled when a mixture of sulphur and phosphorus was used. In almost all studies sulphur was found to have a positive effect on the growth of plants. This benefit is achieved through lowering the soil pH and increasing the availability of phosphorus, manganese and micronutrients. In all such studies it was found that the crop yield increased, and the quality of the crops improved as well. PASTILLLE : 4 MM DIA. X 2 MM HIGH. PACKING IN 25 KG & 1200 KG. JUMBO BAGS. (24 MT. / 20’ CONTAINER). PASTILLE : 4 MM DIA. X 2 MM HIGH. PASTILLLE : 2 MM DIA. X 2 MM HIGH.